Home » VectorVest » Buy IGas Energy (IGAS.L) says VectorVest. The stock offers an attractive proposition for the adventurous investor. 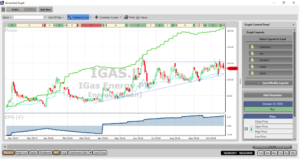 Buy IGas Energy (IGAS.L) says VectorVest. The stock offers an attractive proposition for the adventurous investor. By Harry Dacres-Dixon in VectorVest on 24th October 2018 . IGas Energy (IGAS.L) is a leading British oil and gas explorer and developer, producing 2,500 barrels of oil equivalent per day from over 100 sites across the country. IGAS has played a key role in Britain’s onshore energy production; exploring, developing and producing onshore oil and gas at its various sites for over three decades. Management and technical teams have many years of experience in onshore energy production and most live and work in the communities in which the Company operates. IGAS is extremely well positioned for the future as the UK moves closer to unlocking Britain’s untapped unconventional oil and gas resource. The VectorVest stock portfolio analysis and management platform flagged a series of positive metrics for IGAS over the summer of 2018. In particular, the RV (Relative Value) metric, (an indicator of long-term price appreciation potential) flagged a sharp move higher in June 2018, and today continues to log IGAS as excellent at 1.43 (on a scale of 0.00 to 2.00), along with an excellent GRT (Earnings Growth Rate) rating of 28%. The GRT metric reflects a company’s one to three year forecasted earnings growth rate in percent per year. The well-documented issues in the UK with shale gas and fracking are reflected in a fair RS (Relative Safety) rating of 0.91 (again on a scale of 0.00 to 2.00). Finally VectorVest records a valuation of 163p per share, indicating that at the current 113.75p the stock is undervalued. 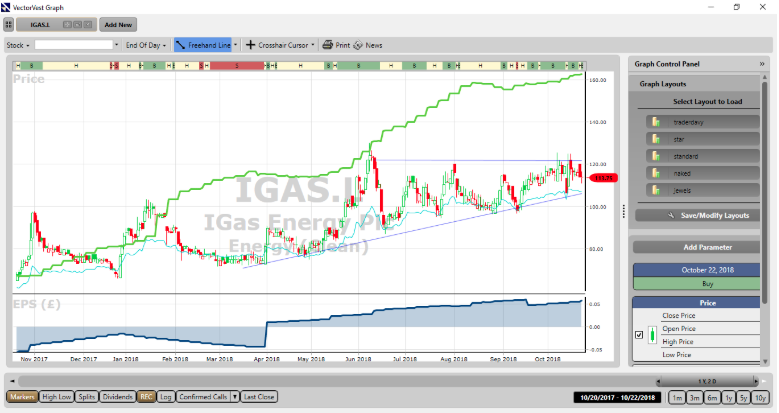 A candlestick chart of IGAS.L over the last year is shown above. The VectorVest valuation is shown by the green line study in the same window as the share price. The share is currently trading within a ascending triangular formation which is regarded by technical analysts as one of the most bullish pattern in a chartists arsenal. The share is on a VectorVest Buy signal. The technical target from a break of the ascending triangle is similar to the VectorVest valuation. Summary: Some investors may look at our IGAS recommendation and turn away on account of the controversy surrounding fracking and the development of the UK shale gas industry. That would be to ignore a growing, well-managed company that offers a decent spread of risk across a number of UK shale gas projects at various stages of development. From both a fundamental and technical (charting) standpoint, VectorVest rates IGAS as an attractive proposition for the adventurous investor. Buy.